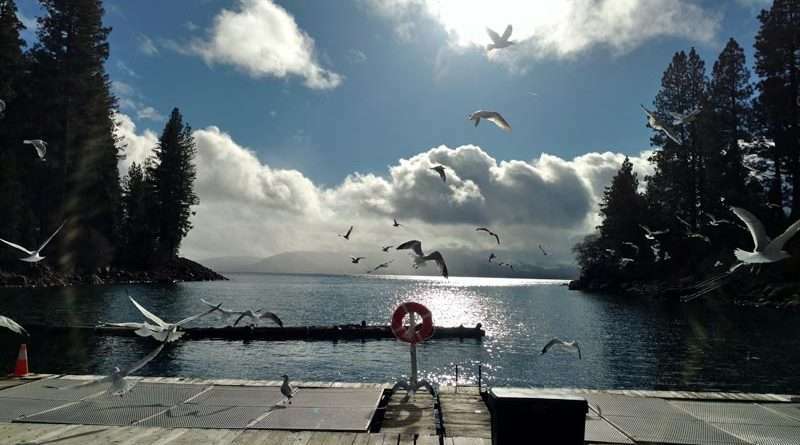 “Have you been out to the AFA trout rearing cages down at the Hamilton Branch yet?’ said Almanor Fishing Association volunteer Michael DeWall. The AFA is rearing rainbow and brown trout for release later this year into the lake. There’s a team of fish feeding volunteers that take turns going down to the cages each and every day. AFA is also lending a hand to help Chester High School and Feather River College with their own brown trout hatchery programs. FRC plans to donate approximately 40,000 brown trout fry to the AFA’s Lake Almanor trout rearing program later this year. FRC hatched the brown trout earlier this winter and they are rearing them until they get large enough to be transferred to the AFA cages. “Probably sometime in early summer,” said DeWall. AFA John Crotty is making arrangements for the association to have a workday at FRC this spring to help out the program with a little house keeping and some facility improvements. “John (Crotty) is doing a great job of leading the AFA,” said DeWall. “I know I’m one of the new kids (64-year-old kid) on the team, but when I became aware of all the good programs the AFA is leading at Lake Almanor (like the Vets’ fishing day and the trout rearing program) it made me want to be a part of it.” DeWall is one of the Saturday feeders along with another AFA member, John Green. “Almanor Fishing Association has what we like to believe is the longest running (1985) most successful fish rearing program in the state,” said Crotty. This year the program received 50,000 fertile Shasta Lake Rainbows from the California Department of Fish and Wildlife Hatchery in Darrah Springs. “We received our fish in mid-October and will release them around mid-April depending on our feed supply and adequate feed in the lake,” said Crotty. The general plan is to coordinate the release with the warming trend that instigates bug hatches for the young fish to feed upon. The AFA volunteers get out to feed the trout every day from mid-October to mid- spring. “In fact, we have not missed a day of feeding in more than two years,” said Crotty. A fact the group takes great pride in. Last year AFA spent $11,000 on pen repairs and a log boom, and the fish food cost $9,300. The AFA uses the same high quality feed that CDFW uses in their hatcheries. “We rely on the expertise of our Plumas County Biologist Amber Mouser and Darrah Springs Hatchery Director Kevin Cecatto to establish our feeding plan,” said Crotty. AFA is working with Chester High School and the Almanor Research Institute to raise Browns. AFA volunteers feed and assist CHS teacher Dallas Tognotti as needed and plans to assist Tognotti in financing improvements to the facility. “We will be voting to approve $4,700 towards those upgrades within the next few weeks,” said Crotty. A field trip to the Feather River College fish hatchery featuring a tour led by FRC Hatchery Manager Adam Fuller provided a glimpse for AFA volunteers of the early stages of the trout coming their way. Another AFA project is the maintenance of the Doug DeAngelo public access parking lot at Hamilton Branch during the summer. Volunteers clean, paint, remove weeds and debris twice yearly and pay to have the public restrooms cleaned throughout the season. The Association also provides six fishing trips for two veterans from Field of Dreams each year. The veterans receive two nights lodging, a guided fishing trip and all meals. AFA works alongside the Lake Almanor Chamber of Commerce to assist them as needed at Sportsman’s Shows bringing awareness to the tourism opportunities in Plumas County. And finally, it takes a village to raise 50,000 trout. Almanor Fishing Association volunteer feeders are: David Baker, Aaron Kelly, Bob Michael, John Crotty, Phil Datner, Brett Hurff , Ed Organ, Gary Hinshaw, Lee Perry, Ron Mendoza, Doug Neal, Steve Flemming, Neal Carter, Ray Pallari, George Hormel, Henry Gronroos, John Green and Michael DeWall. Substitute feeders are Randy Wright, Bill Pierault, Scott Devereaux, Gregg Thaden, George Hawkins, Eric Rudgers and Gil Serrano. “Brett Hurff is the Vice President of AFA and oversees our pen program,” said Crotty.